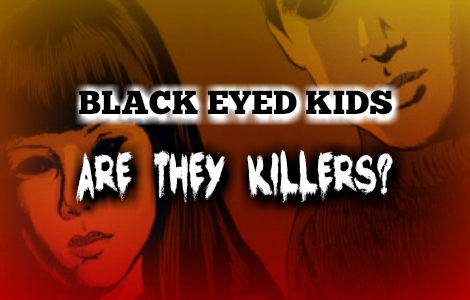 Black Eyed Kids: Are They Killers? I just read your BEK story about the guy who lost time. I live in Broward County, Florida. Something odd and frightening occurred last Summer. I woke up during the night around 2AM to a boy and girl knocking on my front door. I thought there may be an emergency, so I opened the door and the two were just standing there staring at me. I asked what was going on and they told him they needed to come inside. I asked why, but they didn't answer me. I then asked them if they were in some kind of trouble or lost, but they just stared at me. I was getting pissed and starting to 'wake up' at this point. That's when I took a closer look at these two kids and noticed that neither had whites in their eye...in fact, they didn't seem to have pupils. I freaked out and told them to go home and quickly shut the door. I called the local cops and told them that two kids were knocking on doors. A cruiser was sent out to the neighborhood but they didn't find anyone walking around. They figured it was just local kids messing around. The more I thought about what happened the more I got an eerie reaction to the encounter. A few days later I was pulling up to my house and saw the same two kids standing on the corner of my street. A dark haired girl about 12 years old and a boy with similar colored hair, probably the same age. Both kids were just standing on the street corner staring at my neighbor's house. I stood in my driveway for a few seconds and watched them. They didn't say or do anything. I walked inside, did a few things, then walked back outside to see if the two kids were still there. They were gone. That same night I again woke around midnight to the sound of sirens. My neighbor's house was on fire. There were fire trucks in the front and in the back alley. I later spoke to the cops and told them that those same two kids were staring at my neighbor's house earlier that day. The cops didn't seem to think it was important. Then later that night, the body of my neighbor was found in the fire debris. It was determined that she had been bludgeoned and stabbed to death. I was brought into the police department and questioned for several hours. I believe that they thought I may have killed my neighbor. The cops then seemed to think that her boyfriend was involved.